Looking down at Earth from a hawk’s perspective has inspired many drone pilots to seek unchartered airways, often crossing legal boundaries. A new incident reported from Las Vegas in which a drone flies by a descending passenger airplane at an alarming proximity has now drawn the attention of aviation authorities and the drone community. First reported by KLAS TV’s website LasVegasNow, the incident came to sight because of a video clip recorded using the offender drone. 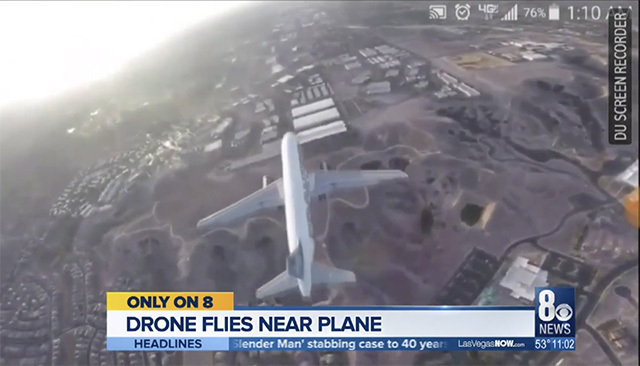 The video clip shows the drone floating mid-air closely above an Airbus passenger jet flown by Frontier Airlines which was preparing for a landing at the McCarran International Airport. The incident is now being investigated by the Federal Aviation Administration (FAA). Air Transport World has held the drone flight to be “clearly illegal and reckless“, as the unmanned aircraft was flying at more than 400 feet above the ground and was at the danger of colliding with the flight, which could have resulted in a crash. Although drones provide excellent opportunities for businesses and law enforcement agencies, it can also be misused by rebellious citizens who want to mess around with the law. Such violations can earn individuals penalties up to $1,437 which can be extended up to $32,666 in case of businesses. For activities with a criminal motive, culprits can be fined up to $250,000 and sent to jail for up to three years. The incident has received mixed responses from the drone community. Several drone enthusiasts have criticized this as a publicity stunt, while many like drone instructor Chris Cernuto believe that the video appears crafty and could be from an airplane simulation video game, citing that the flaps were not “fully engaged“. This is clearly backed by the fear that news of such events will stigmatize the use of drones by civilians. Drone U, a resource provider for drone pilots, took to Facebook and bashed the “criminal act” which “endangered the [lives of the] flying public“. The event has also given rise to a debate over a drone’s potential dangers to an airborne passenger flight, but no matter what, it is dangerous and if you own a drone, we recommend you to abide by the law and not sabotage public safety.